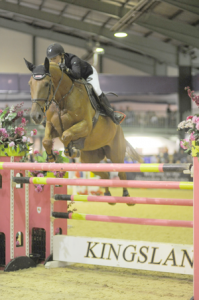 Laura Renwick,39, from Maldon, Essex with Colin Bates’ chestnut gelding Heliodor Hybris were victorious in the Montse Benitez Foundation Seven year-old Championship, which was held as part of the Alexanders Horseboxes British Showjumping SCOPE Festival on Wednesday 27th August. “He is one for the future, he has a great attitude and wants to jump,” said Laura. It is the fourth time Laura has won this title. Her previous winners are Limelight De Breve (2006), Beluga (2008) and Parvati De Breve (2010).